Three-time Oscar nominee and Golden Globe-winning actress Viola Davis will lend her voice to California State University, Northridge’s Black History Month celebration this year. Davis, whose role in the 2016 film “Fences” earned her the Golden Globe for Best Supporting Actress and her third Academy Award nomination — the most ever for an African-American actress — will speak to CSUN students, faculty and staff at CSUN’s Associated Students Productions Big Lecture at 6 p.m. on Wednesday, Feb. 8, in the Valley Performing Arts Center. CSUN’s Black History Month festivities will officially begin on Wednesday, Feb. 1, with a reading and discussion led by Cedric Hackett, a professor in CSUN’s Africana Studies department, at 11 a.m. in the University Student Union (USU) Flintridge Room. The lecture will be followed by a dance performance at 12:30 p.m. at the USU Plaza del Sol. The performance will feature dance instructor Jeffrey Larosa-Adams, Africana studies chair Theresa White, and the dancers with the Black Diaspora student team. Also on Feb. 1, there will be a meet-and-greet with various CSUN black student organizations at 5 p.m. in the USU Lake View Terrace Room. 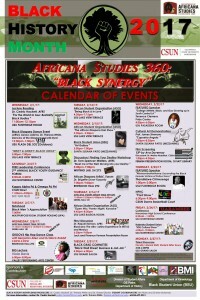 This year’s celebration, themed “Africana Studies 360: Black Synergy,” will highlight the similarities that unite black people — while also focusing on what makes them distinct as individuals. Organizers aim to highlight the synergistic aspect of this theme and the cooperation it entails, throughout the month. “Exploring the diversity of our culture is one of our main goals,” said Hackett, who, along with White, served as co-producer of the department’s organizing committee. “Our culture is infused with a plethora of differences and similarities that makes it very unique. In addition to the Department of Africana Studies, the Black Student Union (BSU), the CSUN chapter of the NAACP, the National Association of Black Journalists-Student Association of Black Communicators, the Black Alumni Association and the Sistahood Group will participate in the events. Other planned programs for the month include the Second Annual Black Youth Guidance Forum, hosted by the W.E.B. DuBois-Fannie Lou Hamer Institute for Academic Achievement, from 8:30 a.m. to 3:30 p.m. on Feb. 4 in the USU Northridge Center. And on Feb. 23, “#RememberHerName: Excavating the Black Female Victims of Police Terror” — a discussion with freelance journalist Thandisizwe Chimurenga about the implications of police violence against black women — will take place from 1 to 3 p.m. in the USU Flintridge Room. The Delmar T. Oviatt Library will present events celebrating Black History Month as well, including a discussion with author Robert Lee Johnson about his most recent book, “Notable Southern Californians in Black History,” from 2 to 4 p.m. on Feb. 23 in the Jack & Florence Ferman Presentation Room. A full list of the library’s events can be found on its Exhibitions and Events webpage. 5 p.m. on Feb. 3 at the Oviatt Library Lawn – A screening of the Jackie Robinson biographical film “42,” featuring jazz performances and food trucks. The screening will be moved to the Jack & Florence Ferman Presentation Room in the event of rain. 4 p.m. on Feb. 8 at Redwood Hall room 292 – GROOV3 Hip-Hop Dance Class with Benjamin Allen and DJ Black Rabbit. 3:30 p.m. on Feb. 15 at the USU Lake View Terrace Room – The African Diaspora Hair Show. 5 p.m. on Feb. 15 at the Santa Susana Patio mezzanine – BSU art gallery. noon on Feb. 16 at the Oviatt Library Learning Commons – Vocal ARTillery and Open Mic. 16 at 4:45 p.m. in the USU Lake Balboa Room – Open Mic/Poetry Night/Karaoke. 21 at 4 p.m. in the USU Grand Salon – Black Wall Street: Business and Job Fair. 22 at 4 p.m. in the USU Pasadena Room – “College Athlete, Black and Gay Growing Up in South Central LA” – featured speaker Terrence Clemens. 24 at 8:30 a.m. in the USU Northridge Center – Harambee High School Conference. For more information about CSUN’s Black History Month celebrations, contact the Department of Africana Studies at (818) 677-3311.